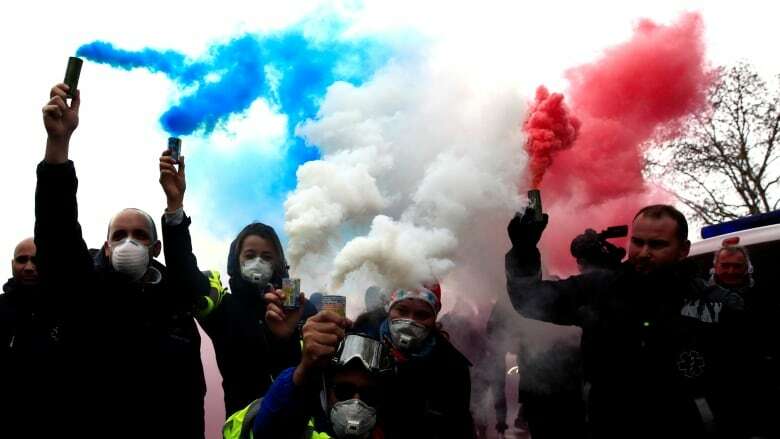 Anti-government protesters gain new allies as French paramedics and students join rallies while the prime minister meets with political rivals in a bid to ease the anger following riots that rocked Paris. 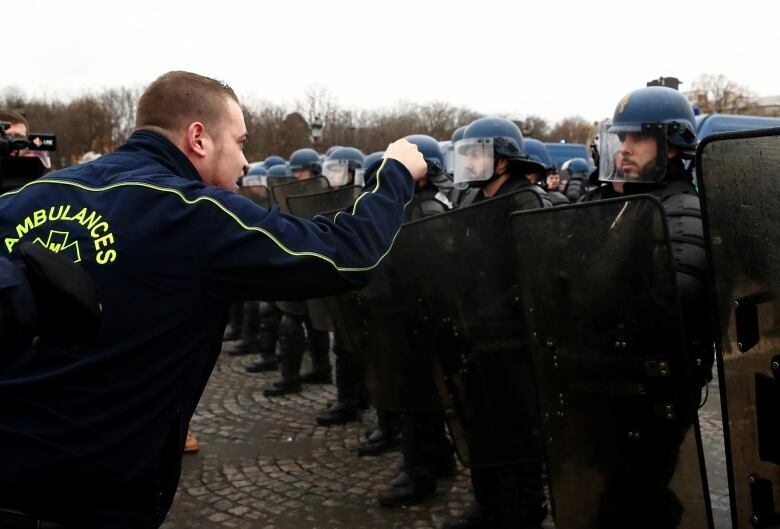 Anti-government protesters gained new allies Monday as French paramedics and students joined rallies while the prime minister met with political rivals in a bid to ease the anger following riots that rocked Paris. 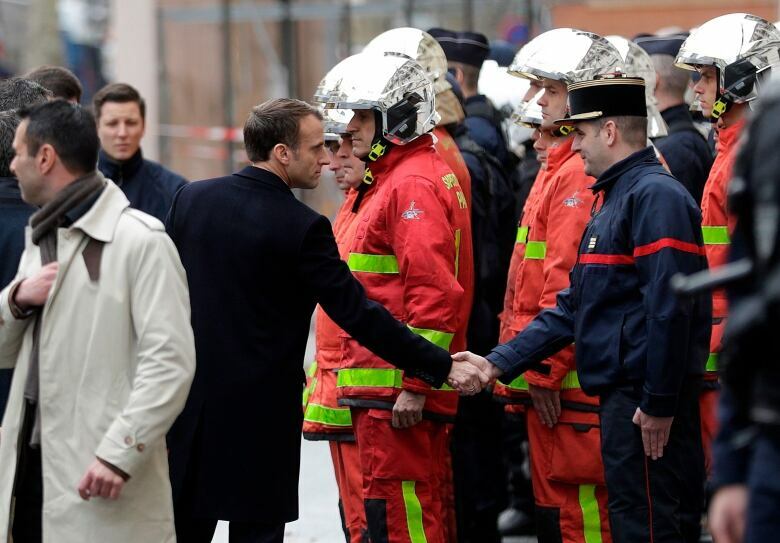 Facing the most serious crisis since his election in May 2017, President Emmanuel Macron remained silent but met with police officers to offer them support after "a day of unprecedented violence," the Élysé​e palace said. The "yellow vest" or "yellow jacket" movement — led by protesters wearing the distinctively coloured roadside safety garb used by motorists — is bringing together people from across the political spectrum complaining about France's economic inequalities and waning spending power. More protests took place on Monday in Paris as dozens of ambulances blocked a bridge leading to the National Assembly. Lines of riot police stood in the rain to prevent them from getting too close to the building. Clashes between protesters and police officers took place again Monday on the Indian Ocean island of Réunion, where demonstrations have been particularly violent in recent weeks. Macron, just back from the Group of 20 summit in Argentina, held an emergency meeting Sunday on security. The government hasn't ruled out the possibility of imposing a state of emergency. Serbian President Aleksandar Vucic said the crisis has forced Macron to postpone a visit to Belgrade that would have started Wednesday "for a couple of weeks." 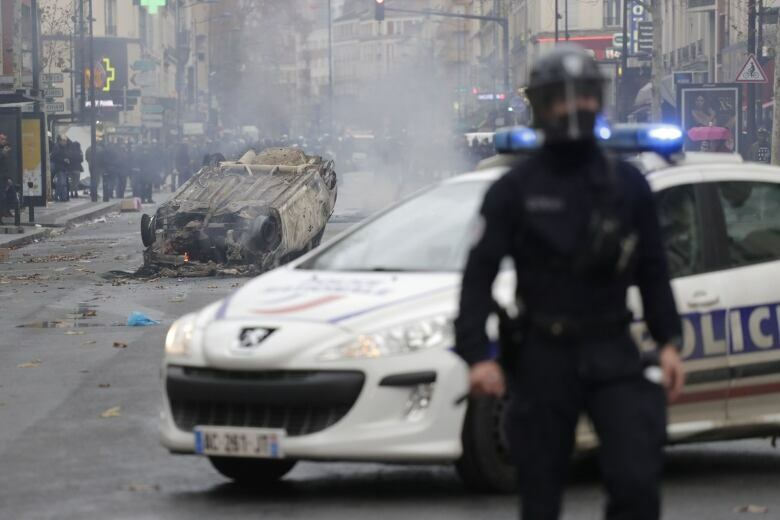 Saturday's rioting was the third straight weekend of clashes in Paris. The protests began last month with motorists upset over a fuel tax increase and have grown to include a range of complaints that Macron's government doesn't care about the problems of ordinary people. Other protests in France remained peaceful. During Monday's protest by paramedics, some demonstrators set fire to a small pile of debris and blocked traffic. One activist held up a sign reading "The State killed me" and others chanted "Macron resign!" Prime Minister É​douard Philippe and Macron have been lambasted for their handling of the crisis. After meeting with the prime minister, Socialist leader Olivier Faure urged Philippe to drop the tax hikes and restore a wealth tax that was slashed by the centrist government. "We want a change in the method. One needs to come down from Mount Olympus," Faure said, referring to Macron's nickname of Jupiter, the mythical god. Laurent Wauquiez, head of the centre-right Les Ré​publicains party, urged Macron to hold a referendum to end the crisis but didn't say what its topic should be.